The Black Boy Inn, Caernarfon, Gwynedd hotels with instant confirmed online booking. We have Hotels throughout Gwynedd , Wales . Accommodation near all the attractions, places to see and things to do.......You are able to make an instant secure confirmed online booking. We also offer information on Airports, and travel and tourist information. The Black Boy is a 16th-century inn within Caernarfon\'s historic town walls. It has good real ales, hearty meals, and is an easy walk from the town centre and 13th-century castle. 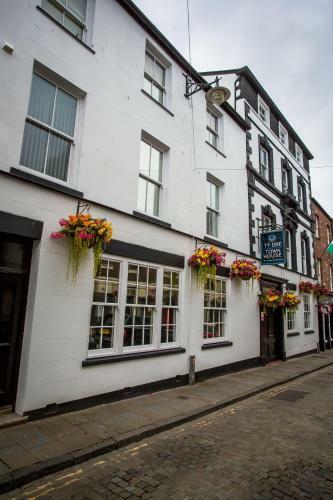 The Black Boy Inn dates back to 1522 and is one of the oldest inns in North Wales. Some of its walls are 1.2 to 1.5 metres thick. The wood panelling, creaking floorboards, low ceilings, narrow staircases and thick wooden beams create a cosy atmosphere. Black Jack\'s is a separate part of the inn and is located in a courtyard to the rear. It provides modern accommodation including junior suites with kitchenettes. Caernarfon is a market town with an open-air market every Saturday (Mondays also in summer). Car parking is allocated by reception at check-in, if you are an early arrival you will be given a parking permit and directed to Slate Quay Car Park by the castle. Please note that for group bookings of over 4 rooms different policies apply.